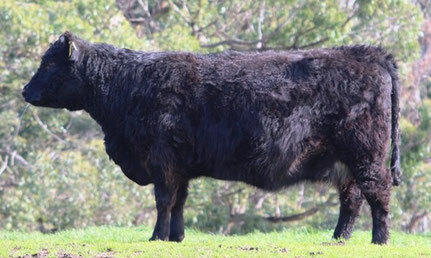 You could call them “Scottish Blacks” as both breeds originated in Scotland! Whatever you want to call them they are top beef cattle. 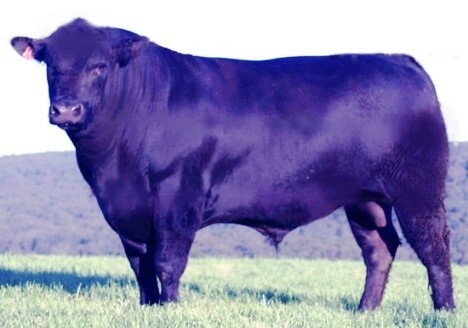 Angus genes come from the following herds> Te Mania, Lawsons, Hazeldean, Amberley Park, etc. Bloodlines include: Bushwhacker, New Dimension 7127, Hingala 469, Booroomooka Theo, Highlander of Stern, Ardrossan Casino C18, Te Mania Infinity etc. Producing long, thick, and deep progeny. Out a great old cow. Easy doing growth rate and a moderate maturity pattern. Near perfect structure and very good temperament. Galloway genes have come from 300 fullblood black Galloway females in the Amberley Park herd run on the limestone hills of Buchan. Our new home is in the Strzelecki Ranges at Hallston, South Gippsland, Victoria. This herd was started in 1962 and has been performance tested since 1965. Genetics from this herd have been sold to all states of Australia, exported to Russia & NZ and used in other composite breeding programmes. "The Galloway herd of cows are bred to survive and thrive"